I lost my schnauzer in a tragic accident. I wan't going to get another dog. A friend saw my grief and suggested, no insisted, that I get another one. I agreed and started looking for another dog. Guess what breed I was looking for? I found an ad in the paper from a breeder that had recent puppies. Judging by the area code I thought it was a short drive. After calling, I found out that it would be a three-hour drive. I was reluctant to do it, but my friend saw that I needed to. After some convincing, I agreed. I went with the intent of getting another salt and pepper or a black puppy. After the breeder had me take off my shoes and disinfect my hands he brought the litter of six out for me to see. This little, white puppy did not hesitate to run up and start kissing me. How could you say no? Now she is my best friend! She's so cute, what's her name? Beautiful girl! 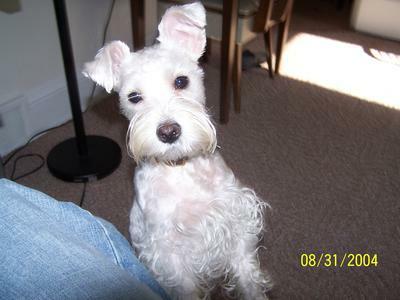 love the white schnauzers. Her name is Lilly White Lileth. Lilly is her everyday name. Lovely name. It suits her, she looks like a Lilly!